Last week, Montgomery County officials announced that they've picked developers to build on four publicly-owned sites in Silver Spring and Wheaton. Residents worry that the process isn't more inclusive, but are cautiously optimistic about the potential for new investment. 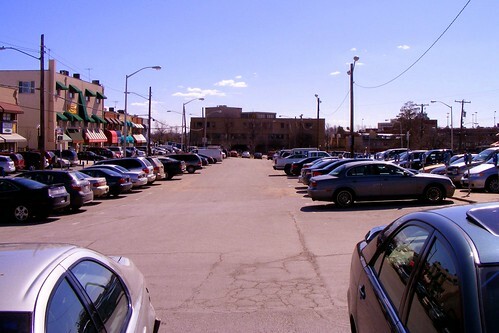 Parking Lot 13, one of the redevelopment sites in downtown Wheaton. Photo by the author. StonebridgeCarras and Bozzuto will get to redevelop two public parking lots and the Mid-County Regional Services Center on Reedie Drive in Wheaton, along with the 3.24-acre Planning Department headquarters on Georgia Avenue in Silver Spring. In return, they'll build a new regional services center, offices for the Planning Department and another county agency, and a town square in Wheaton. In July, county officials put out a Request for Proposals to develop all four sites together, rather than put them out to bid separately. The county previously had plans with developers to build on the four sites and had received substantial community input on how to do them, but the deals fell through. The development team is locally-based and has some experience working on large, mixed-use projects. StonebridgeCarras is finishing the massive Constitution Square project in NoMa, while Montgomery County recently picked them to to build a new police station in Bethesda. Bozzuto has built dozens of apartment and condominium buildings in the region, including two in downtown Wheaton. Residents in both Silver Spring and Wheaton say they're anxious about the county's announcement and whether the community will get to provide input after having lots of opportunities to do so in the past. 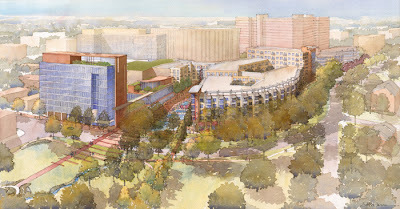 Bozzuto was also part of the development team for SilverPlace, the Maryland-National Capital Park and Planning Commission's plan to replace the Planning Department and Department of Parks' 1950's-era headquarters in Silver Spring. The agency invited neighbors to participate in a design charrette, or workshop for the site, which resulted in a proposal to build new offices alongside 300 apartments, a grocery store and other shops, and a public park. Rendering of SilverPlace from Torti Gallas and Partners. Completed in 2008, the plan had public buy-in, but fell through when the development team disagreed about financial terms. At a June presentation by county officials in Silver Spring, neighbors worried that their previous input won't be included in the new deal. "Back in 2008, there was a more inclusive process," said Darian Unger, who was chair of the Silver Spring Citizens Advisory Board when the charrette occurred. "There was a discussion, public input was valued." Meanwhile in Wheaton, the county made a deal with developer BF Saul in 2010 to build several million square feet of apartments, shops, and offices in downtown Wheaton, along with a town square. 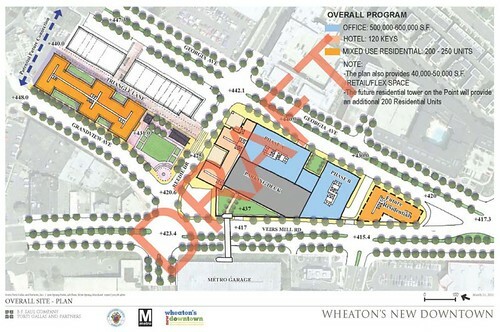 BF Saul had a website and public outreach team to gather feedback, but the deal collapsed when the County Council balked at the $39.5 million price tag of building a platform over the Wheaton Metro station so BF Saul could build office towers on top. BF Saul's aborted plan for downtown Wheaton. Image from BF Saul. Instead, councilmembers agreed to instead fund the construction of a new town square and Planning Department headquarters, which the new development team will build. At the time, resident Henriot St. Gerard called the decision a "show of disrespect" to the public. Now chair of the Wheaton Urban District Advisory Committee, St. Gerard said he first heard about the decision via an email blast from county officials last week. "The county was pretty silent about things and I respected that," he wrote in an email. "I wish we were at least told that a decision had been made and an announcement would be made soon." At the meeting in Silver Spring, Jacob Sesker, who advised the County Council on the BF Saul deal, argued that this process would be more inclusive than had the county just sold off the land. "This is likely to result in more input from the community than the disposition of property would," he said. "It's very important that this community voice its concerns, but to understand that 2013 is not going to be the same as 2008." The architects who helped craft both SilverPlace and the BF Saul plan offered to work with the county and the new development team. "We would be interested in working with developers that are interested in having that . . . memory, if you will, of community involvement," said Tom Gallas, principal of Silver Spring-based Torti Gallas and Partners, at the July meeting. County officials say they'll show the developers the previous designs, but won't hold them to it. Al Roshdieh, deputy director of the Department of Transportation, noted that the county used a similar development process in the revitalization of downtown Silver Spring. "The bottom line is the quality of the proposal," he said. "I hope that one day we're proud of whatever the result of this is." This week, the county will hold two more public meetings to discuss their announcement and where they'll go from here. Tonight, they'll meet at the Planning Department at 8787 Georgia Avenue Silver Spring Civic Building at One Veterans Place in Silver Spring. On Wednesday, they'll be at Wheaton High School at 12601 Dalewood Drive. Both meetings will be at 7pm. Community leaders are cautiously optimistic about the new process. "All of us on WUDAC, including myself have some [skepticism] about the process. The best thing we can do as a group though is stay on top of developments and react accordingly," wrote St. Gerard. "It is only fair we approach redevelopment with an open mind as oppose to a place of confrontation and/or bitterness." Good bye Wheaton town center. Good bye small ethnic independent shops and restuarants - time to shut you down to put in a new government building for county employees and build more Applebees and CVS's. Good bye ugly Parking Lot 13 (and good riddance!). The redevelopment doesn't have to eliminate the ethnic independent shops and residences, although it may price some of them out of the town center. In fact, I would think that the presence of office workers during the day and hundreds of new apartments would actually help many of the better small businesses like Marchone's or Saigonese. There is an overabundance of small business space in Wheaton, including a number of unleased properties. A healthier Wheaton looks like an integration of the best small businesses, mainstream retail stores, residences, and offices.